“In the New Testament, Jesus is presented as the ‘author,’ ‘captain’ or ‘pioneer’ of salvation (Acts 3:15; 5:31; Hebrews 2:10; 12:2). The word archegos (author) is notoriously difficult to translate into English. In the case of Jesus (especially in the context of Hebrews) it seems to convey the twin notions of primacy and origin. Jesus is the ‘author’ of our sanctification, in the sense that He creates it for us, but He is also its ‘pioneer’ because He does so out of His own incarnate life, death and resurrection. He is the ‘pioneer’ of our salvation, because as the Hero of Faith (to be distinguished from the long list of those heroes who bear witness to Him, Hebrews 12:1), He has endured the cross, despising its shame and the opposition of sinners, and is now seated at God’s right hand. He is the first and only fully sanctified person. He has climbed God’s holy hill with clean hands and a pure heart (Psalm 24:3-6). It is as the ‘Lead Climber’ that He gives the sanctification He has won to others (Acts 5:31). As ‘pioneer,’ Jesus has Himself gone ahead of us to open up the way to the Father. By doing so, He brings to the Father in similar obedience all those who are ‘roped’ to Him by grace and faith. Christ is our sanctification. In Him it has first come to its fulfillment and consummation. He not only died for us to remove the penalty of our sin by taking it himself; He has lived, died, risen again and been exalted in order to sanctify our human nature in Himself for our sake. 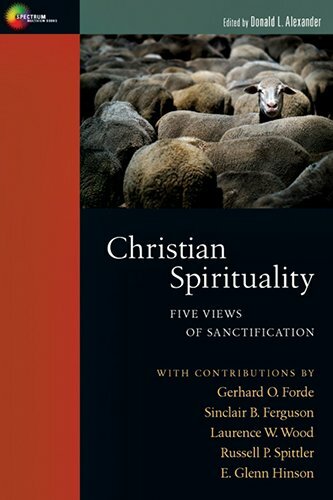 –Sinclair Ferguson, Christian Spirituality: Five Views of Sanctification, Ed. Donald Alexander, (Downers Grove, IL: InterVarsity Press, 1988), 49.